Costantino explains the influences—intricate as a Sicilian cassata–that ancient Romans, Greeks, Byzantines, Lombards, Normans, Spanish, and French exerted through the centuries on the dessert traditions of the southern portion of the peninsula and the island of Sicily. She tells of a wave of Swiss immigrants in the late 1800s, among them pastry chefs who brought butter that would soon rival strutto (lard) the preferred baking fat of the area. Local foodstuffs inform the character of all these sweets: Ricotta, honey, pistachios, figs, watermelon, lemons, oranges, amarena cherries, mosto cotto, walnuts, chestnuts, and chickpeas. Recipes range from ultra-simple to more intricate. Dolci di Noci (walnut cookies) have but three ingredients. The Sfogliatelle Ricce (flaky Neapolitan pastries with semolina-ricotta filling) require six pages and step-by-step photographs. The techniques look do-able requiring only time, patience, and manual dexterity. I promise you, I am going to try the sfogliatelle and will report back. 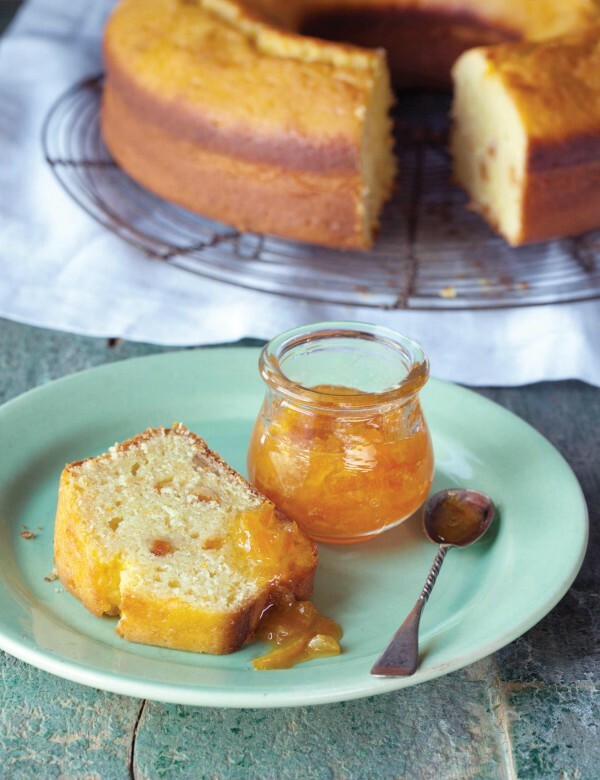 In the meantime, here is a recipe for an intensely orangey, easy bundt cake. Full disclosure: I tried to purchase candied orange peel but had no luck sourcing it in my local stores (seems to be a Christmas item). I had to candy my own peel and was glad of it. It was great fun and the results were so good. I have some candied peel left over to dip in dark chocolate for snacking. “No matter whether it is a bread, cake, or donut, if it is ring-shaped and you can eat it, in Italy we call it ciambella. This moist, orange-scented, cake is one of my favorites for coffee or tea time,” writes Rosetta Costantino. "I was served a similar cake topped with a spoonful of homemade marmalade for breakfast at Casa Janca Agriturismo in Pizzo. My version gets a beautiful shine by soaking the baked cake with orange juice. Chopped candied orange peel gives the cut slices a jeweled appearance. The standard Italian ciambella pan has a diameter of 26 centimeters (about 10 inches) and is 8 centimeters (about 3 inches) high, with a tube in the center that is taller than the sides of the pan. The cake also turns out well when baked in a Bundt or standard tube pan. Look for oranges that have not been sprayed or waxed because you will be using quite a bit of the rind; you will need about six large oranges. It is easiest to zest the oranges before juicing them." Preheat the oven to 375°F (190°C) with a rack in the center of the oven. Butter and flour a 10-inch (12-cup) ciambella, Bundt, or tube pan, knocking out the excess flour. Stir together the flour, baking powder and ½ teaspoon of the salt in a bowl. In another bowl, whisk together the egg yolks and 1¼ cups of the sugar until thick. Whisk in the olive oil, orange zest, 1½ cups of the orange juice, and the orange extract, if you are using it. Stir in the flour mixture just until it is combined. Beat the egg whites with a pinch of salt in the bowl of a stand mixer at medium-high speed until medium-firm peaks form that are not at all dry. Use a large spatula to gently fold the egg whites into the batter. Fold in the candied orange peel. Spread the batter evenly in the prepared pan. Bake until the top of the cake splits and begins to turn golden, about 40 minutes. A toothpick inserted into the cake should come out clean. Let the cake cool in the pan until you can easily handle it, about 20 minutes. Unmold the cake onto a wire rack top side up and place the rack over a rimmed baking sheet. (When using a ciambella pan, the cake is traditionally served split side up.) Let the cake cool completely. To make the soaking syrup, strain the remaining ½ cup of orange juice into a small bowl and stir in the remaining 2 tablespoons of sugar until it dissolves. Slowly pour the syrup evenly over the top of the cake, allowing it to soak in as you pour. Use a pastry brush to brush the remaining syrup all over the outside of the cake. To serve, cut the cake in slices using a thin, sharp knife or serrated knife. Store leftovers at room temperature, well wrapped, for up to 2 days, or freeze for up to one month. "Each year in early spring, using the last oranges form our abundant backyard crop, I make candied orange peels to last through the year. What does not get used in cannoli, gelato, and other desserts will surely be enjoyed as candy, on its own or dipped in melted dark chocolate, or given to friends as holiday gifts. You can purchase candied orange peels, but they are costly and are never as good as homemade. Blanching the peels five times removed their bitterness and enhances their texture and flavor. Choose organic fruit that has not been sprayed or coated with wax, because you’ll be eating the peels. Segment the leftover orange flesh and add it to fruit salads, squeeze it for juice, or use it to make Marmellata di Arance," writes Rosetta Costantino. Use a paring knife to cut the peel from the orange, pith and all, in wide strips running from top to bottom. They will have an elongated diamond shape, about 1 inch at the widest point. Put the peels into a large soup pot and cover them generously with cool water. Bring to a boil, boil for 2 minutes, and drain. Repeat the boiling and draining twice more. Return the peels to the pot, cover with cold water until cool enough to handle, then drain. Lay one strip skin side down on a flat surface and use a paring knife running parallel to the rind to cut away most of the white pith inside, leaving about ⅛ inch of pith along with the peel. Repeat with the remaining strips. (Discard the trimmings.) Return the peels to the pot, cover with cold water, and blanch two more times as before, for a total of five blanchings. Drain the peels and set aside. Stir the sugar, lemon juice, and water in the pot. Bring to a boil and simmer for 15 minutes to slightly thicken the syrup. Add the peels and cook until they are shiny and translucent, about 1 hour. Remove the pot from the heat and let the peels plump in the syrup overnight. Transfer the peels to a wire rack set over a rimmed baking sheet to dry. As you remove each peel from the syrup, run it between your thumb and forefinger to squeeze any excess syrup back into the pot. When the peels are no longer tacky—24 to 48 or more hours later—transfer the peels, a few at a time, to a shallow bowl of sugar, tossing to coat them well. Return the peels to the rack to dry overnight. Transfer the peels to an airtight container with parchment paper separating the layers and store in the freezer, where they will keep for at least a year. 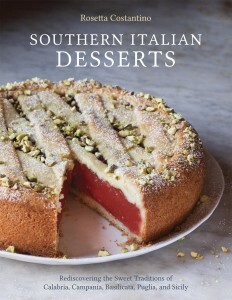 What southern Italian dessert are you hoping to find in Costantino’s new book? Thank you for such a wonderful review. I am so happy that you made the candied orange peel, as you found out there is nothing like it in the store and it is what makes the desserts from Southern Italy so delicious. I would love to come back east and promote my book. If there is a venue that I should contact please let me know. I hope that we do get to meet someday. If you ever come to the Bay Area please let know. 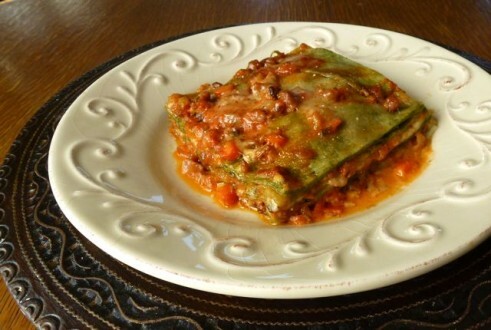 Or maybe you can join me in my culinary tour to Calabria. Rosetta really is, as Domenica says, the real deal. 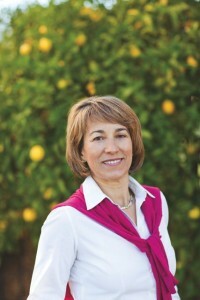 I have spent hours with her first book, “My Calabria”, and I expect it will be the same with this one. All I can say is thank heavens her family came to the U.S.! Thanks for commenting. Have you traveled to Calabria? It’s on my list but haven’t gotten there yet. Your site looks fabulous. Can’t wait to explore it. Sharon, thanks for posting this thoughtful review. I had the pleasure of meeting Rosetta at a conference last fall. She is the real deal. I have My Calabria and love it. I’ve been meaning to pick up a copy of this book. Thanks for the reminder. Thanks to you for tweeting the post. I hope Rosetta come east to promote the book so I can meet her, too. Or, maybe IACP should book her for a seminar at Conference in Chicago!